Meth Lab Explosion features some classic heavy thrash rhythms with fast paced harmonised lead guitar. The legato playing is fluid and there’s some insanely fast passages in here using exotic sounding scales. Thom pulls out all the stops in getting crazy solo sounds out of the guitar, this is definitely one of the most unusual sounding bouts of pure shredding I’ve heard. Taming the Wyvern is a big departure from that, with Thom flexing his neo-classical guitar muscles in style. 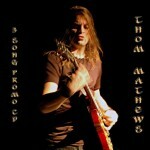 The track switches between eloquent classical guitar passages to searing melodic lead guitar – listening to it you sense a nod to Yngwie Malmsteen but still very distinctly Thom’s own style. Finally, The Tear Collector is a true shred instrumental ballad, again with Thom using harmonised guitar and silky smooth legato to great effect. The melodic lead and the heavy Metallica-esque rhythm section complement each other really well, and Thom uses a wide range of tones and techniques on the lead guitar to keep the instrumental interesting. Overall a very interesting promo to listen to, it’s certainly got me interested in hearing more from Thom Matthews and I look forward to featuring him more on the site! 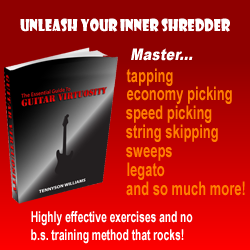 When it comes to shred, you do not really hear as much these days as you would say in 1986, so its a tough scene out there. This guy really endures a lot of pain and hard work to go through what he does in a scene so unappreciated. So many harmonies and licks throughout the songs completely composed of solos keep your interest through the utter feeling and passion poured into songs like Tear Collector. Meth Lab Explosion is like shred from outer space that has been floating around in the cosmos bouncing around being gravitationally pulled from one direction to the other. This stuff is really good and quite unique. This guy deserves to be releasing these shred albums on a label. Maybe a label that recognized talent and vision rather than what is popular will grab a hold of this and present it as it should be simultaneously making this guy as popular as it should be. It sure is deserving and these words can’t even begin to encompass the hard work and endurance that is poured into true music like this!